The traditional high-performance computing (HPC) system uses CPUs working in parallel for computationally intensive tasks. This kind of system is including our primary server of Chalawan, castor. For the castor, we have 19 compute nodes with totally 496 cores of CPU plus two Intel Xeon Phi cards (see node configuration). The Intel Xeon Phi cards have been used as coprocessors that help us to speed up the computational tasks. However, we have learned that using the coprocessor is challenging and the application that supports is really limited. Some of the hard-coding users which have the skill in parallel programming may gain great benefit using this coprocessor, but it is not the big portion of our users. Therefore, we looked for another system which contains the graphics processing units (GPUs) used as the accelerators. The GPUs have been rapidly developed for many years to provide the more general purposes in computational tasks than the coprocessors. The GPUs are used in mobile devices, embedded systems, personal computer, HPC system, etc. Moreover, there are plenty of supported applications. Gigabyte G190-H44 is 1U size server which can supports up to four GPU cards. First of all, we installed CentOS 7.4 on the two nearline SAS harddisks with RAID0 configuration. After system update completed, the machine was rebooted to runlevel 3. In this mode, we can simply install NVIDIA driver and CUDA toolkit, then we rebooted it again so that the new kernel can be loaded. We ran the command, nvidia-smi, to make sure the driver installation is completed. Unfortunately, the command result showed only two out of four GPUs. We suspected that would be the problem with redundancy configuration. So, we opened up the server and moved one of the GPU cards from the front pane to back pane. After reboot, the command finally showed the proper information. We planned to test this GPU node with the applications that used by our users and the application they are going to use, such as Quantum Espresso (GPU edition), DSPSR, and TensorFlow. We then realised that we are not familiar with the GPU system yet there are so many things to learn. Because of this, we can test only one application: TensorFlow. TensorFlow is an open source machine learning framework by Google. It can be built to support MPI, OpenCL and CUDA. 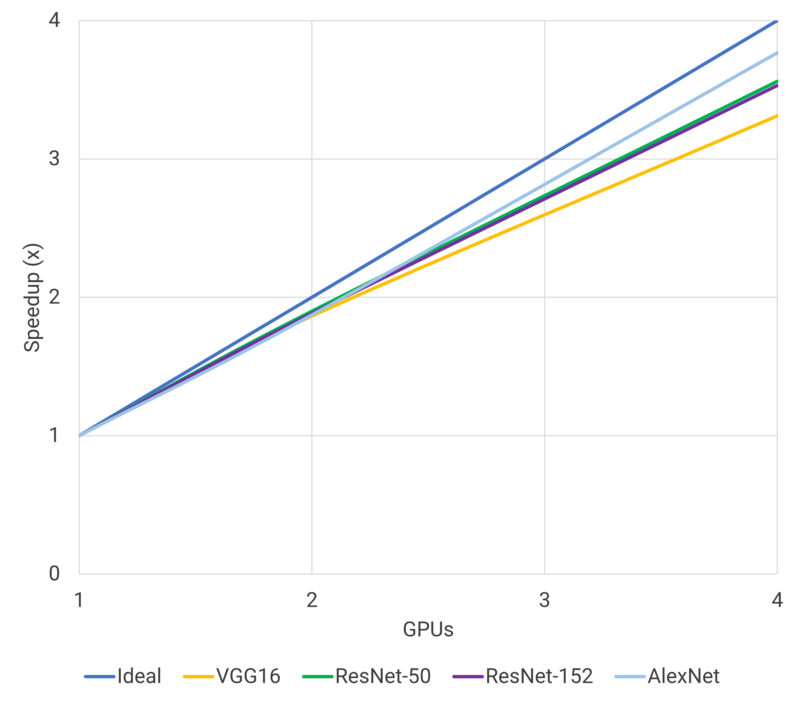 In this test, we try to maximize performance by compiling TensorFlow with CUDA from source. 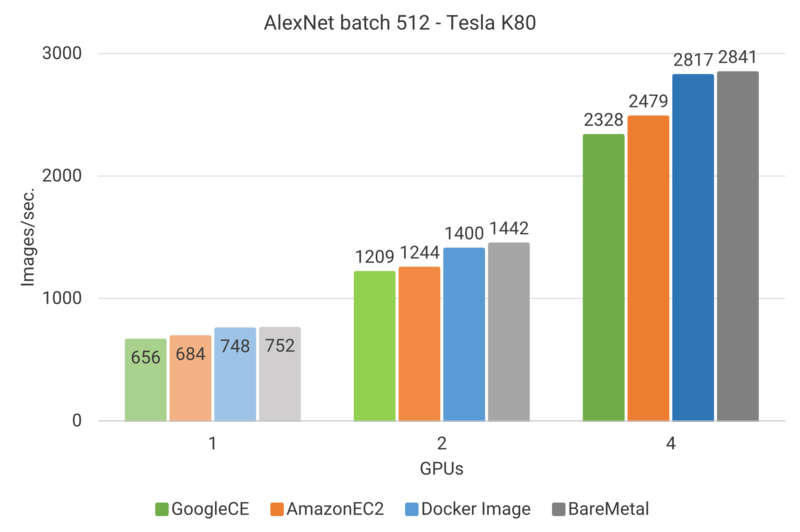 The benchmark was carried out by running the scripts to train the widely accepted image classification models on a bare-metal server and another one on docker container. Next, we will compare the results to the other results from the Google Compute Engine and Amazon Elastic Compute Cloud (Amazon EC2). ResNet-50, ResNet-152, VGG16 and AlexNet models were tested using synthetic data from tf.variable. The tests were run on Gigabyte G190-H44 on physical server and another one on the docker container. 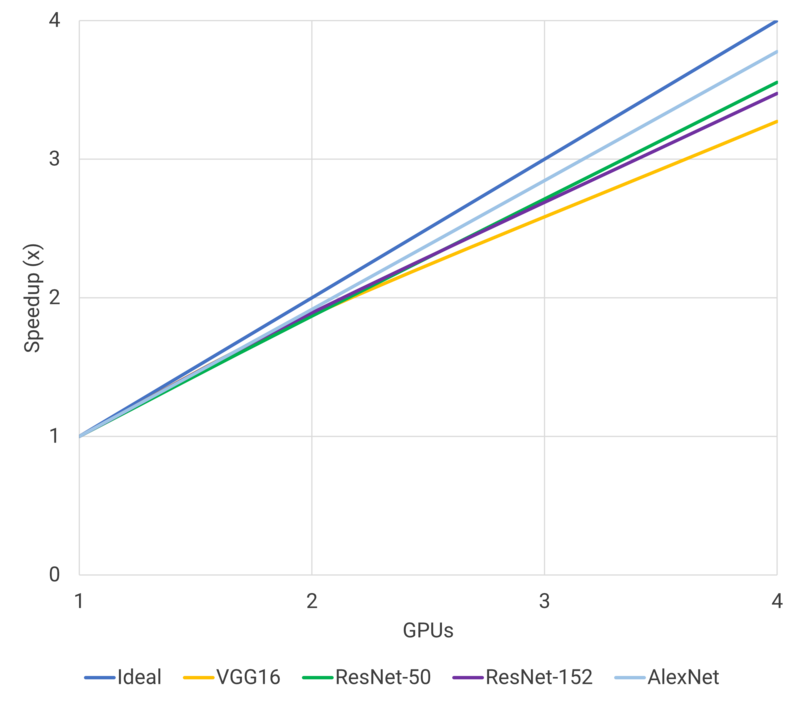 As expected, the results on physical server (the grey graph) show the highest performance due to the lowest computational overhead possible. The docker image on our cluster (the blue graph) is a little bit lower and still perform better than the Google compute engine and Amazon EC2. 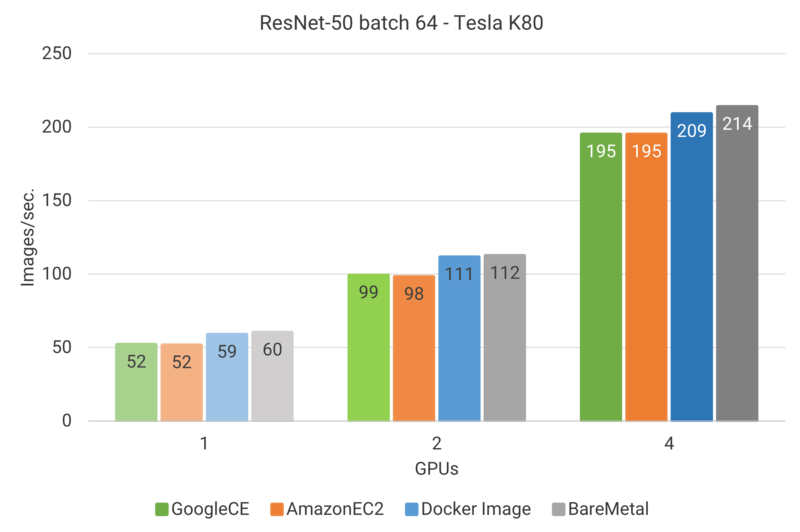 However, the tests are biased since the baseline tests were made with older version of TensorFlow (1.1.0rc2) and our tests were made by TensorFlow 1.8. 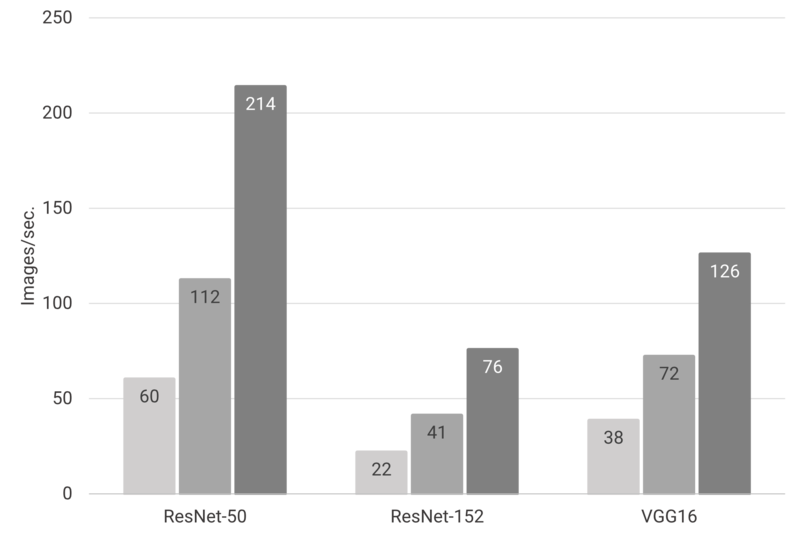 In the next post, testing on NVIDIA Tesla V100, we will show the performance gain by running TensorFlow 1.9 compare to TensorFlow 1.1.0rc2 and the tests with other softwares. 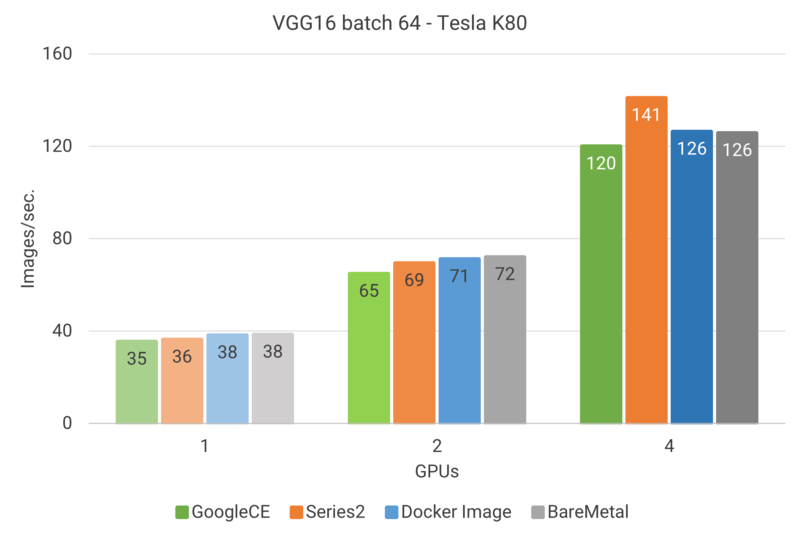 Training: VGG16 model with Tesla K80 on various machines. Training: ResNet-50 model with Tesla K80 on various machines. Training: ResNet-152 model with Tesla K80 on various machines. 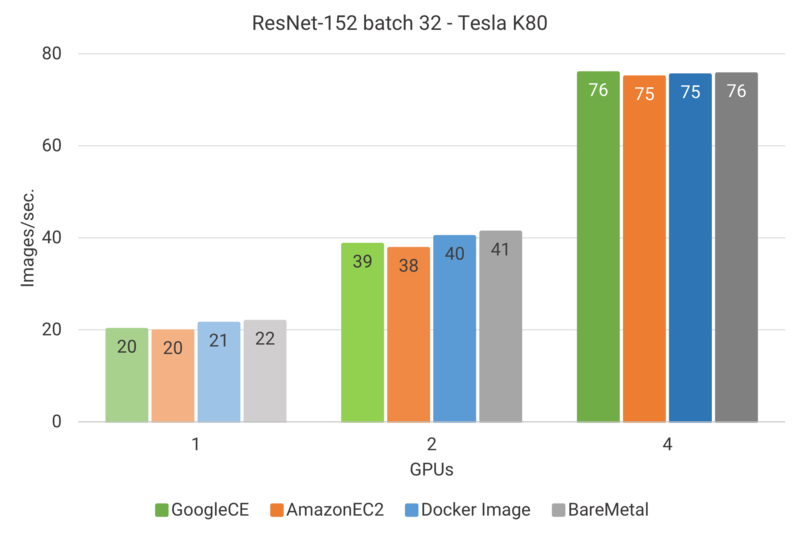 Training: AlexNet model with Tesla K80 on various machines.